Michael Ruppert received the Dipl.-Ing. Degree in automation technology in production, with a specialization in systems theory and automatic control, from the University of Stuttgart, Germany, in 2013. In 2017, he received the Ph.D. degree with Excellence Award in electrical engineering from The University of Newcastle, Australia where he is now a Postdoctoral Research Fellow with the School of Electrical Engineering and Computing. As a Visiting Researcher, he was with the Mechanical Engineering Department, University of Texas at Dallas, USA. systems, high performance microscopy and nanotechnology. His recent work has focused on the development of estimation, control and self-sensing approaches for microelectromechanical (MEMS) systems such as piezoelectric microcantilevers and nanopositioning systems for multifrequency and single-chip atomic force microscopy. Dr Ruppert received the Academic Merit Scholarship from the University of Stuttgart, the Baden-Württemberg Scholarship, and held Postgraduate Research Scholarships with the University of Newcastle and with the CSIRO, Clayton, VIC, Australia. Dr Ruppert's research has been recognized with Best Conference Paper Finalist Awards at the 2018 International Conference on Manipulation, Automation and Robotics at Small Scales (MARSS) and a the 2013 IEEE/ASME International Conference on Advanced Intelligent Mechatronics (AIM). In 2018, the article Multimode Q Control in Tapping-Mode AFM: Enabling Imaging on Higher Flexural Eigenmodes published in IEEE Transactions on Control Systems Technology received the 2018 IEEE TCST Outstanding Paper Award. Design, fabrication and instrumentation of piezoelectric microcantilevers for multifrequency atomic force microscopy and high-resolution mass-sensing. High-bandwidth, low-noise demodulation techniques for multifrequency atomic force microscopy. Fabrication of piezoelectric microcantilevers and nanotips in the clean room. 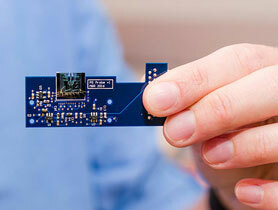 Research and development of a MEMS-based on-chip atomic force microscope. Analysis of process stability of a scanning tunneling microscope enabled nanolithography in collaboration with industry.Planning and setup of the Laboratory for Dynamics and Control of Nanosystems (LDCN). This course treats the basic principles of the automatic control of industrial processes and machines. The emphasis of the subject is on continuous time control, although some introductory material on sequential logic control (or programmable logic control) is included. © 2017 Author(s). The quality (Q) factor is an important parameter of the resonance of the microcantilever as it determines both imaging bandwidth and force sensitivity. The ability to control the Q factor of multiple modes is believed to be of great benefit for atomic force microscopy techniques involving multiple eigenmodes. In this paper, we propose a novel cantilever design employing multiple piezoelectric transducers which are used for separated actuation and sensing, leading to guaranteed collocation of the first eight eigenmodes up to 3 MHz. The design minimizes the feedthrough usually observed with these systems by incorporating a guard trace on the cantilever chip. As a result, a multimode Q controller is demonstrated to be able to modify the quality factor of the first two eigenmodes over up to four orders of magnitude without sacrificing robust stability. IEEE A major challenge in atomic force microscopy is to reduce the scan duration while retaining the image quality. Conventionally, the scan rate is restricted to a sufficiently small value in order to ensure a desirable image quality as well as a safe tip-sample contact force. This usually results in a conservative scan rate for samples that have a large variation in aspect ratio and/or for scan patterns that have a varying linear velocity. In this paper, an adaptive scan scheme is proposed to alleviate this problem. A scan line-based performance metric balancing both imaging speed and accuracy is proposed, and the scan rate is adapted such that the metric is optimized online in the presence of aspect ratio and/or linear velocity variations. The online optimization is achieved using an extremum-seeking approach, and a semiglobal practical asymptotic stability result is shown for the overall system. Finally, the proposed scheme is demonstrated via both simulation and experiment. © 2015 IEEE. A fundamental challenge in dynamic mode atomic force microscopy (AFM) is the estimation of the cantilever oscillation amplitude from the deflection signal, which might be distorted by noise and/or high-frequency components. When the cantilever is excited at resonance, its deflection is typically obtained via narrow-band demodulation using a lock-in amplifier (LIA). However, the bandwidth of this measurement technique is ultimately bounded by the low-pass filter, which must be employed after demodulation to attenuate the component at twice the carrier frequency. Furthermore, to measure the amplitude of multiple frequency components, such as higher eigenmodes and/or higher harmonics in multifrequency AFM, multiple LIAs must be employed. In this paper, the authors propose the estimation of amplitude and phase using a linear time-varying Kalman filter that is easily extended to multiple frequencies. Experimental results are obtained using square-modulated sine waves and closed-loop AFM scans, verifying the performance of the proposed Kalman filter. © 2016 Ruppert and Moheimani; licensee Beilstein-Institut. License and terms: see end of document. Using standard microelectromechanical system (MEMS) processes to coat a microcantilever with a piezoelectric layer results in a versatile transducer with inherent self-sensing capabilities. For applications in multifrequency atomic force microscopy (MF-AFM), we illustrate that a single piezoelectric layer can be simultaneously used for multimode excitation and detection of the cantilever deflection. This is achieved by a charge sensor with a bandwidth of 10 MHz and dual feedthrough cancellation to recover the resonant modes that are heavily buried in feedthrough originating from the piezoelectric capacitance. The setup enables the omission of the commonly used piezoelectric stack actuator and optical beam deflection sensor, alleviating limitations due to distorted frequency responses and instrumentation cost, respectively. The proposed method benefits from a more than two orders of magnitude increase in deflection to strain sensitivity on the fifth eigenmode leading to a remarkable signal-to-noise ratio. Experimental results using bimodal AFM imaging on a two component polymer sample validate that the self-sensing scheme can therefore be used to provide both the feedback signal, for topography imaging on the fundamental mode, and phase imaging on the higher eigenmode. © 2002-2012 IEEE. We present new insights into the modeling of the microcantilever in dynamic mode atomic force microscopy and outline a novel high-bandwidth tip-sample force estimation technique for the development of high-bandwidth z -axis control. Fundamental to the proposed technique is the assumption that in tapping mode atomic force microscopy, the tip-sample force takes the form of an impulse train. Formulating the estimation problem as a Kalman filter, the tip-sample force is estimated directly; thus, potentially enabling high-bandwidth z-axis control by eliminating the dependence of the control technique on microcantilever dynamics and the amplitude demodulation technique. Application of this technique requires accurate knowledge of the models of the microcantilever; a novel identification method is proposed. Experimental data are used in an offline analysis for verification. © IFAC. We evaluate two novel reciprocal self-sensing methods for tapping-mode atomic force microscopy (TM-AFM) utilizing charge measurement and charge actuation, respectively. A microcantilever, which can be batch fabricated through a standard microelectromechanical system (MEMS) process, is coated with a single piezoelectric layer and simultaneously used for actuation and deflection sensing. The setup enables the elimination of the optical beam deflection technique which is commonly used to measure the cantilever oscillation amplitude. The voltage to charge and charge to voltage transfer functions reveal a high amount of capacitive feedthrough which degrades the dynamic range of the sensors significantly. A feedforward control technique is employed to cancel the feedthrough and increase the dynamic range from less than 1dB to approximately 30 dB. Experiments show that the conditioned self-sensing schemes achieve an excellent signal-to-noise ratio and can therefore be used to provide the feedback signal for TM-AFM imaging. This project aims to establish a state-of-the-art femtosecond laser micromachining facility providing unparalleled advanced manufacturing capabilities for a wide range of materials to Australia’s research community. The facility’s unique capabilities, in particular rapid and precise machining, will create novel prototyping opportunities across the fields of micro/nanotechnology, material sciences and biomedical sciences. The instrument will also allow fast and precise prototyping of bulk materials. Anticipated outcomes include advanced materials manufacturing and prototype devices for unique applications in harsh environments. The proposed facility is expected to provide significant advances across a variety of research fields including but not limited to micro electromechanical systems, microfluidics, biomechanics, and it will also enhance multidisciplinary collaborations. The equipment is an automated XYZ scanner to improve the imaging capabilities and productivity of a confocal Raman microscope. This upgrade will enable the 2D and 3D mapping of tissue, polymeric devices, cells, catalysts, and microelectronic devices. This project represents a new research collaboration between engineering, medicine, and physics.The new imaging modality will be employed to map the chemical composition of cancer cells, with a view to differentiating cell types based on the internal concentration of metabolites. Integrated actuation and sensing with piezoelectric transduction schemes enables the development of a multimode controllers which exhibits remarkable performance in arbitrarily modifying the quality factor of multiple eigenmodes and comes with inherent stability robustness. The goal of these controllers is to provide improved imaging stability, higher scan speeds and adjustable contrast when mapping nanomechanical properties of soft samples. This work motivates a class of probes based on microelectromechanical system (MEMS) design with integrated actuators and sensors optimized for multifrequency operation. Specifically, integrated piezoelectric transduction schemes enable the miniaturization of the Atomic Force Microscope towards a cost-effective single-chip device with nanoscale precision in a much smaller form factor than that of conventional macroscale instruments. modern multi-frequency techniques, where higher harmonic and/or higher eigenmode contributions are present in the oscillation signal, the fidelity of the estimates obtained from some traditional demodulation techniques is not guaranteed. This project proposes novel demodulation schemes with high measurement bandwidth, multi-frequency capability and low measurement noise which are rigorously compared against traditional techniques. 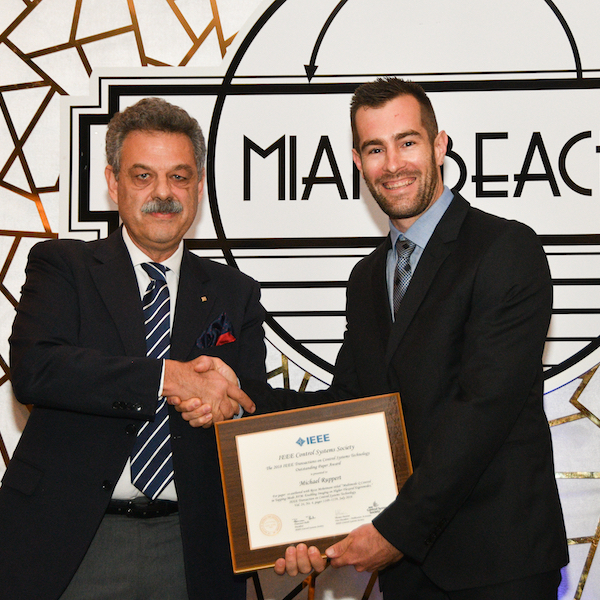 Dr Ruppert attended the IEEE Control Systems Society Awards Ceremony at the 2018 IEEE Conference on Decision and Control in Miami, Florida to accept the outstanding paper award from the journal IEEE Transactions on Control Systems Technology. Read more about this important research breakthrough.